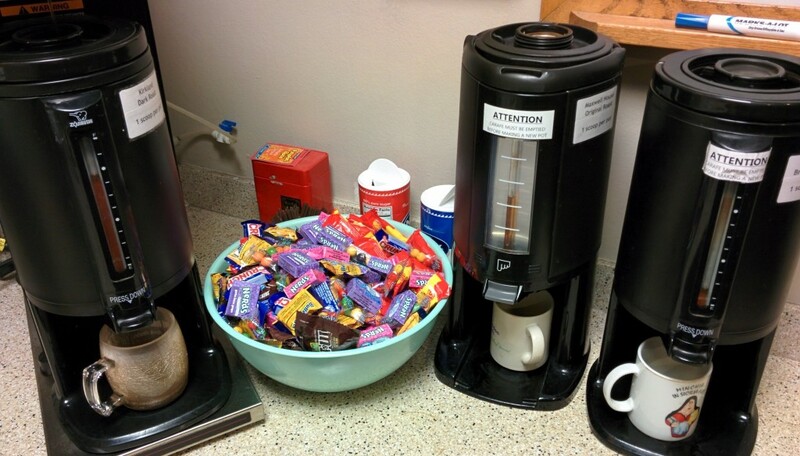 It’s an office disaster waiting to happen. As I mentioned on an earlier post, Halloween was a bust in terms of seeing any kids in costume. The last thing we need is to keep a shitload of candy in the house considering that neither of us should be eating it. What to do? Tremble at the sight of Candy Mountain! I’m a little worried I may be responsible for multiple diabetic comas today so if you see me on the evening news, well, this would be why. Cuddles finds the Christmas bows. Our orange tabby cat, Cuddles, is very playful and surprisingly smart. He knows where we keep all his favorite toys and he’ll often seek them out to bring to us when he wants to play. One of his all-time favorite things to play with are the bows that go on gifts. Anne did some tidying up of the computer room yesterday and made the mistake of letting cuddles see where she put a few stray bows and ribbon. Cuddles love of gift bows is so deep that we often find a ton of them under the couch when we move it to clean. In fact, when the movers picked up the couch to carry it out to the truck back when we moved at the end of May we found a ton of bows that Cuddles had shoved under it. Not only that, but there was a tear in the in fabric cover under the couch that had collected quite a few of the bows so as the guys carried the couch out the door and to the truck they left a trail of Christmas bows behind them like some weird variation on Hansel and Gretel. It was still dropping bows as they carried it into the new apartment. I don’t know if we managed to get all of them out of it. 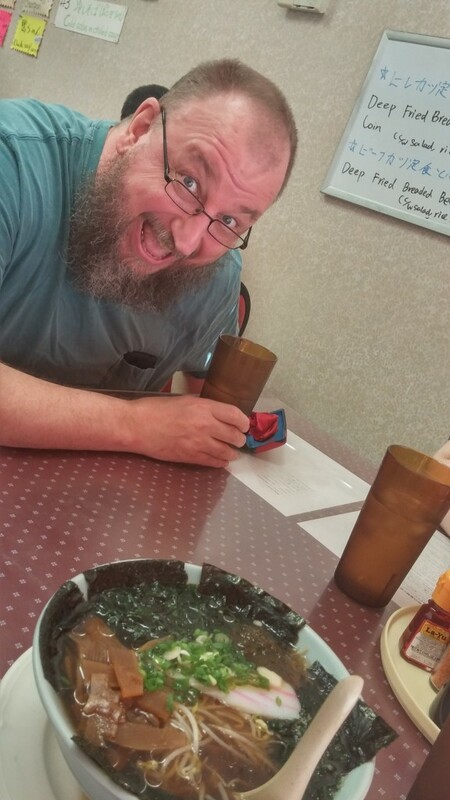 My buddy Greg came over to hang out and watch silly cartoons with me yesterday and then we went out to dinner at Matsuchan, the local authentic ramen restaurant. He was so impressed with his food that he tried to take a pic of it which I tried to photobomb. Looking pretty good! That ramen isn’t bad looking either! Random thoughts that momentarily caught my attention. Memes like this one float around on the Internet quite a lot, but this one in particular caused me to pause and think for a moment. Always a dangerous thing to do. 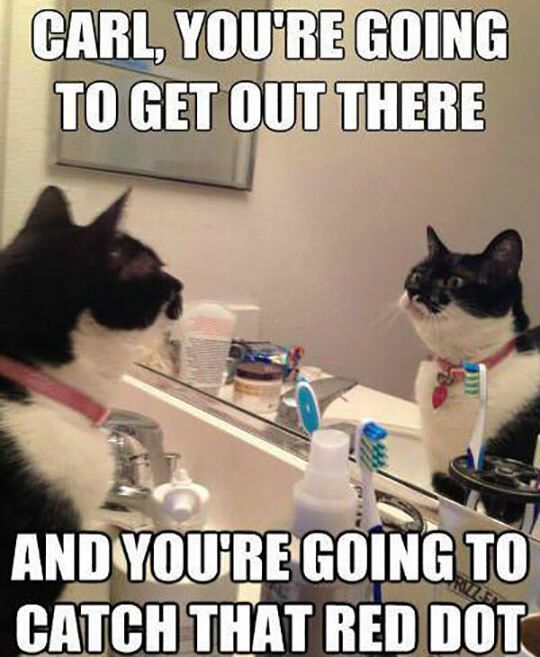 We all need a little motivational pep talk now and then.